Tomorrow, 10/4/13 is NEW Moon Day. 1. Vegetarian Lunch from 11.30am (first-come-first-serve basis). 2. NEW Moon Chanting @ 12.30pm. 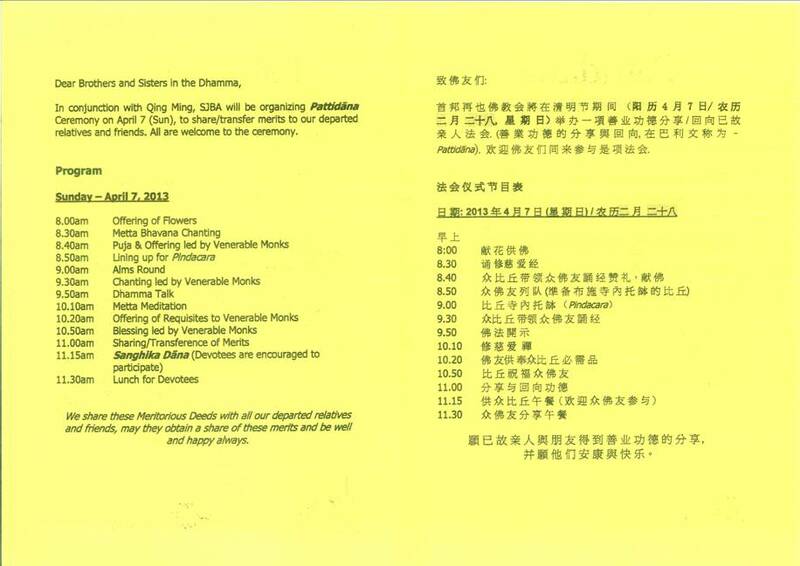 1) In conjunction with Qing Ming, SJBA is organising a Pattidana on this Sunday, 7th April 2013, 8am to 11am, to dedicate merits to the departed ones. Pattidana is for the benefit of those departed relatives and friends who may have been reborn in certain unfortunate state of existence. When they are aware that their relatives or friends have performed some meritorious deeds dedicated to them, they can be relieved of their suffering. When they rejoice repeatedly, their unhappy birth will be transformed to a happy one. It is the duty of relatives to perform these acts of merits for the departed ones. The Pattidana will start with the offering of flowers and lights at 8am, Metta Recitation, Buddha Puja, Dhamma Talk by Bhante Nyanaramsi, Dedication of Merits to Departed Ones. 2) The Introduction to Buddhism course that is ongoing for 8 consecutive Fridays from 8.30pm to 10.00pm will end on 19 April 2013. Today (5 April 2013) the topic is “Noble Eightfold Path” by by Uncle Vijaya. On next Friday (12th April, 2013) the topic is “Living a Life of Peace and Serenity” by Sis Chan Kah Yein. All are welcome. Please contact Sis Lily at 03-56348181 for further details. 3) SJBA is organising an Introduction to Meditation Course conducted by our Abbot, Ven. Nyanaramsi from 26 May to 1 Jun, 8.30pm to 10.30pm (first day orientation followed by 6 lessons) followed by a short Meditation Retreat from 1 Jun to 4 Jun. Ven. Nyanaramsi was an accountant before he was ordained as Bhikkhu in 1995 at Chanmyay Yeiktha Meditation Centre, practicing under Sayadaw U Janakabhivamsa for a total of 9 years. Ven. Nyanaramsi was giving various support for foreign meditators in the Centre before accepting Subang Jaya Buddhist Association’s invitation to come back in 2003 to teach the Malaysian Buddhists. He travels frequently to other countries like Indonesia, Taiwan, Thailand, China, etc to teach meditation. If you wish to join in the Retreat as a yogi, helper or sponsor, please inform Sis. Lily at 03-56348181. 4) SJBA’s Puja Session in Mandarin this Sunday will be off and will resume next Sunday from 11.30am to 12.30pm every Sunday, at SJBA Shrine Hall. All are welcome. 1) As another community service for our members and devotees with SJBA arranging with 2 experienced Chinese Physicians qualified in Traditional Chinese Medicine Treatment to give treatment to those with certain sicknesses and bodily ache/pain, every Saturday, 9am to 12pm, at SJBA. The fees are chargeable at RM30.00 which include the diagnosis, acupuncture or other treatment, and medicine. Those who cannot afford the fees can apply for Humanitarian Aid at SJBA Office. 2) The Introduction to Buddhism course that is ongoing for 8 consecutive Fridays from 8.30pm to 10.00pm will end on 19 April 2013. On this coming Friday (5 April 2013) the topic is “Noble Eightfold Path” by by Uncle Vijaya. All are welcome. Please contact Sis Lily at 03-56348181 for further details. 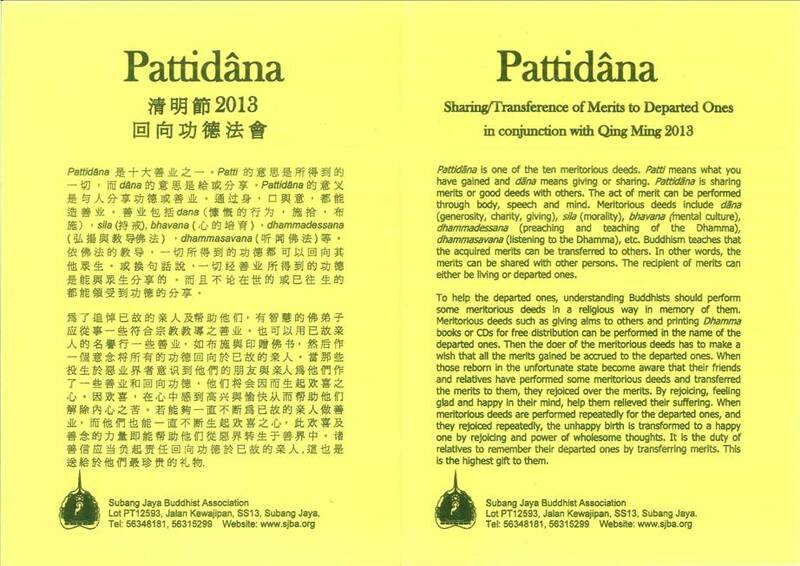 3) In conjunction with Qing Ming, SJBA is organising a Pattidana on next Sunday, 7th April 2013, 8am to 11am, to dedicate merits to the departed ones. Pattidana is for the benefit of those departed relatives and friends who may have been reborn in certain unfortunate state of existence. When they are aware that their relatives or friends have performed some meritorious deeds dedicated to them, they can be relieved of their suffering. When they rejoice repeatedly, their unhappy birth will be transformed to a happy one. It is the duty of relatives to perform these acts of merits for the departed ones. The Pattidana will start with the offering of flowers and lights at 8am, Metta Recitation, Buddha Puja, Dhamma Talk by Bhante Nyanaramsi, Dedication of Merits to Departed Ones. 4) SJBA is organising an Introduction to Meditation Course conducted by our Abbot, Ven. Nyanaramsi from 26 May to 1 Jun, 8.30pm to 10.30pm (first day orientation followed by 6 lessons) followed by a short Meditation Retreat from 1 Jun to 4 Jun. Ven. Nyanaramsi was an accountant before he was ordained as Bhikkhu in 1995 at Chanmyay Yeiktha Meditation Centre, practicing under Sayadaw U Janakabhivamsa for a total of 9 years. Ven. Nyanaramsi was giving various support for foreign meditators in the Centre before accepting Subang Jaya Buddhist Association’s invitation to come back in 2003 to teach the Malaysian Buddhists. He travels frequently to other countries like Indonesia, Taiwan, Thailand, China, etc to teach meditation. If you wish to join in the Retreat as a yogi, helper or sponsor, please inform Sis. Lily at 03-56348181. 5) SJBA’s Puja Session in Mandarin is from 11.30am to 12.30pm every Sunday, at SJBA Shrine Hall. Today’s (31 March) Dhamma Talk will be given by SJBA’s Abbot, Ven Nyanaramsi. Nyanaramsi was an accountant before he was ordained as Bhikkhu in 1995 at Chanmyay Yeiktha Meditation Centre, practicing under Sayadaw U Janakabhivamsa for a total of 9 years. Ven. Nyanaramsi was giving various support for foreign meditators in the Centre before accepting Subang Jaya Buddhist Association’s invitation to come back in 2003 to teach the Malaysian Buddhists. He travels frequently to other countries like Indonesia, Taiwan, Thailand, China, etc to teach meditation. 6) This morning’s Dhamma Talk is on “Dasa Dhamma Raja” in which the Buddha taught about The Principles of Good Governance. Our Speaker this morning is Bro. Tan Huat Chye. Bro. Huat Chye is a much sought after Dhamma Speaker. He has a Master Degree in Socio Psychology. He was member of the Way Farers and is known for writing and composing a number Buddhist hymns. He is a Founder Member and current Advisor of the Kinrara Metta Buddhist Society. He has also presented a number of papers at Buddhist conferences, etc. Bro. Huat Chye is the Principal Consultant of THC Consultancy Sdn Bhd. Time : Leaving SJBA 2.30pm, reaching Ci Hang at 3pm. SJBA is organizing a visit to Ci Hang Cempaka Old Folks Home (31 residents, 16 ladies, 15 men) to bring joy, happiness and peace to the old folks there. Our Abbot, Ven Nyanaramsi will conduct a blessings for the Old Folks. We shall also be bringing some basic necessities. Please see below for the details. SJBA is arranging a bus for this visit. You may call Sis Lily or Sis Cindy (03-56348181) to book a seat, first come first serve basis. If you wish to contribute the requested basic necessities or in cash (for us to buy the necessities), please contact Sis Lily or Sis Cindy. 2) SJBA will be organizing the Introduction to Buddhism course from 1 March to 19 April 2013. The course will run for 8 consecutive Fridays from 8.30pm to 10.00pm and will be conducted by Uncle Vijaya, Bro Charlie Chia and Dr Chan Kah Yein. All are welcome. No pre-registration is required. Please contact Sis Lily at 03-56348181 for further details. 3) In conjunction with Qing Ming, SJBA is organising a Pattidana on 7th April 2013, 8am to 11am, to dedicate merits to the departed ones. Pattidana is for the benefit of those departed relatives and friends who may have been reborn in certain unfortunate state of existence. When they are aware that their relatives or friends have performed some meritorious deeds dedicated to them, they can be relieved of their suffering. When they rejoice repeatedly, their unhappy birth will be transformed to a happy one. It is the duty of relatives to perform these acts of merits for the departed ones. The Pattidana will start with the offering of flowers and lights at 8am, Metta Recitation, Buddha Puja, Dhamma Talk by Bhante Nyanaramsi, Dedication of Merits to Departed Ones. 5) SJBA’s Puja Session in Mandarin is from 11.30am to 12.30pm every Sunday, at SJBA Shrine Hall. Today’s (24 March) Dhamma Talk will be given by Sis Tan Yee Yong who was the former SJBA Youth Section Chairperson and Dhamma Department Head. She currently serves in SJBA Dhamma Subcommittee. Sis Yee Yong graduated with a Bachelor of Science, MBA, Diploma in Buddhism and a Master of Arts in Buddhist Studies (IBC). 6) This morning’s Dhamma Talk is on “Life is suffering – a misconcept or a truth”. The Talk will be given by Bro Tan Kian Koon. Bro. Kian Koon graduated from the University of Malaya in Civil Engineering in 1979. Since his retirement in 2001 from his engineering career, he has been sharing his understanding and experience with all who are keen to search for true happiness, peace and liberation from birth and death, and all mental suffering to become more virtuous, noble and wiser human beings. He gives Dhamma Talks and holds meditation and Dhamma classes at various meditation centres. 4) SJBA’s Puja Session in Mandarin is from 11.30am to 12.30pm every Sunday, at SJBA Shrine Hall. This Sunday’s Dhamma Talk will be given by Ven. Nyanaramsi. Our SDS students will be there to experience the sweat and joy of protecting the environment and to save our Mother Earth!! The collection of recyclable items starts from 8.45 a.m. to 11.00 a.m. at the corridor, next to the Shrine Hall (near the exit gate). Please come and support !! All sorts of papers/newspapers/carton and paper boxes/magazines etc. 1) Today, let us have a few minutes in silent meditation radiating metta to all the suffering ones in Sabah caused by the recent armed intrusion.May suffering ones be free from suffering. May those struck with grief be from from grief. May everyone be free from danger. May the Guardian Devas protect them. May the Blessings of the Triple Gem be with them. 2) As another community service for our members and devotees with SJBA arranging with 2 experienced Chinese Physicians qualified in Traditional Chinese Medicine Treatment to give treatment to those with certain sicknesses and bodily ache/pain, every Saturday, 9am to 12pm, at SJBA. The fees are chargeable at RM30.00 which include the diagnosis, acupuncture or other treatment, and medicine. Those who cannot afford the fees can apply for Humanitarian Aid at SJBA Office. 4) SJBA is starting a Puja Session conducted in Mandarin beginning today (10th March 2013), 11.30am to 12.30pm at SJBA Shrine Hall. There will be a Dhamma Talk by Sis Tan Yee Yong who was the former SJBA Youth Section Chairperson and Dhamma Department Head. She currently serves in SJBA Dhamma Subcommittee. Sis Yee Yong graduated with a Bachelor of Science, MBA, Diploma in Buddhism and a Master of Arts in Buddhist Studies (IBC). 5) The Sutta Class conducted by Bro Chan Khoon San today (10th March) is on “Susima Sutta”. The venue is Room T9, from 3.00pm to 4.30pm. 6) This morning’s Dhamma Talk is on ” Service to Others” by Bro. Tan Siang Chye. Bro. Siang Chye graduated from Kent Institute, UK and with a Master degree from Massey University, New Zealand. He was a former Chairman of the Buddhist Missionary Youth Section and also the parent body, BMSM for one session. He is a striving meditator and has practised under several prominent meditation teachers locally and in New Zealand. Bro. Siang Chye is currently the Chairman of the Dhamma Committee of SJBA.